Hardcover, 6.25 x 6.75 in. / 72 pgs / illustrated throughout. Like nature, only better. Nature with all the awkward bits smoothed out. And then picturesque, like a landscape painting, states Jim Lewis' protagonist, defining an English garden in Cecily Brown's newest book of paintings. An imaginative pas de deux, The English Garden sees British painter Brown (born 1969) and American writer Lewis (born 1963) contribute acutely detailed and darkly sensuous allusions to the traditional 18th-century English landscape garden. 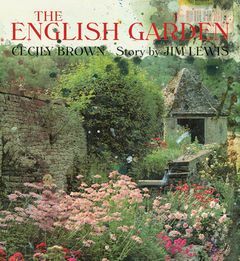 Thirty-nine of Brown's paintings are interspersed throughout this compact hardcover publication as tipped-in images. The largely abstract works, with glimpses of figurative elements, are a dichotomy of warm and subdued strokes of color, each containing an expansive landscape unto itself. Novelist and critic Jim Lewis' story transports the reader to the English countryside and investigates the seductive pull of the natural world in tandem with Brown's paintings. Combining two major voices in contemporary literature and painting, this volume is a truly gorgeous production. 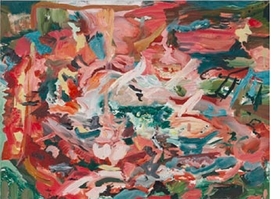 Cecily Brown, “Oh I Do Like To Be Beside The Seaside”, 2014, is reproduced from Cecily Brown & Jim Lewis: The English Garden. FORMAT: Hbk, 6.25 x 6.75 in. / 72 pgs / illustrated throughout.